As happened last year with the release of The Force Awakens every studio and their mothers are releasing trailers for their biggest films of 2017 in hopes of getting them attached to prints of Rogue One which will undoubtedly be seen by more eyeballs than any other movie in theaters this year. One that is something of a given though is that of the first glimpse of our new Spider-Man (Tom Holland) in action as the Sony Pictures/Marvel co-production exists at least partially under the Disney banner. One can bet that Disney will pair their new iteration of the webslinger with as many prints of Rogue One as possible so as to both let those who are unaware we're getting a new Spider-Man movie in 2017 aware of that fact while also giving those who anxiously await that film something to look forward to once the anticipation for Rogue One has passed. It's a win/win all around and this first look at the footage from director John Watts (Cop Car) John Hughes-inspired take on Spidey certainly makes the fact we're getting a new Spider-Man flick just that: a win. In the short tease that was dropped yesterday the fact Holland's Spider-Man would sport the webbed wings that allow him to fly through the air only signaled that Watts and his writers room would be taking their film as retro as we've indeed heard throughout most of the production. From the design of the logo to the very outspoken intent of making this a very young, very inexperienced Peter Parker who enlists Robert Downey Jr.'s Tony Stark as something of a mentor (who designed Spidey's suit as we saw in Civil War and are told in this trailer), but who really just exists as a normal kid with super powers in a world where superheroes are more or less the norm. 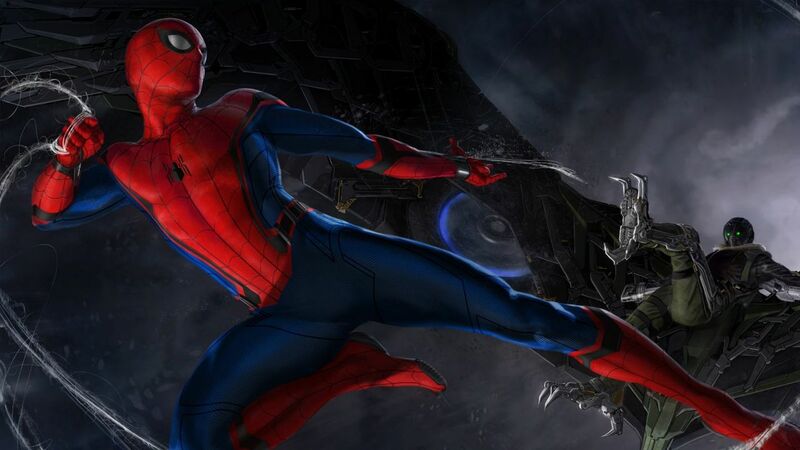 It will be interesting to see how Homecoming brings the newly minted Spider-Man into the Marvel Cinematic Universe, but if this first footage is any indication it seems it will pose no issue at all. Spider-Man: Homecoming also stars Jon Favreau, Michael Keaton, Zendaya, Donald Glover, Jacob Batalon, Laura Harrier, Tony Revolori, Tyne Daly, Bokeem Woodbine, Marisa Tomei, and opens on July 7th, 2017. Synopsis: A young Peter Parker/Spider-Man (Tom Holland), who made his sensational debut in Marvel Studios’ Captain America: Civil War, begins to navigate his newfound identity as the web-slinging superhero in Spider-Man: Homecoming.